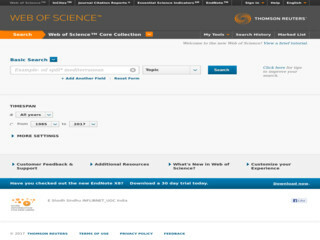 Web of Science (previously known as (ISI) Web of Knowledge) is an online subscription-based scientific citation indexing service maintained by Thomson Reuters that provides a comprehensive citation search. It gives access to multiple databases that reference cross-disciplinary research, which allows for in-depth exploration of specialized sub-fields within an academic or scientific discipline. Web of Science consist of following online databases: Science Citation Index, Social Sciences Citation Index, Arts & Humanities Citation Index, Conference Proceedings Citation Index- Science, Conference Proceedings Citation Index- Social Science & Humanities, Emerging Sources Citation Index, Current Chemical Reactions, Current Chemical Reactions & Index Chemicus.